Want to know a way to instantly endear yourself to anyone you happen to meet in Jordan? 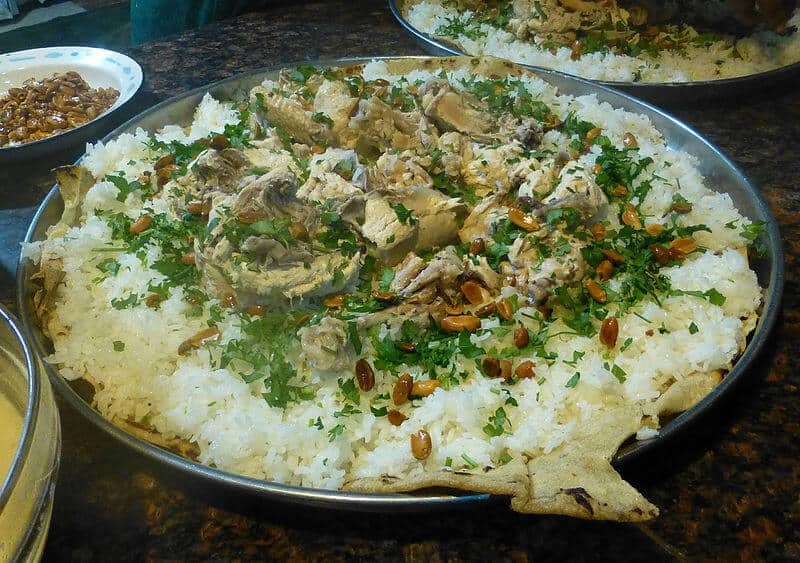 Just mention Mansaf, the country’s official National Dish. Our guide, Ali Abudayeh, had been tantalizing our taste buds for the better part of a week with tales of this traditional Jordanian food. Mary and I love lamb, so the combination of lamb, rice, almonds and fermented yogurt sounded incredibly appetizing. We finally got a chance to try it the day after our visit to Petra, when Ali and our driver, Rami Remawi, took us for a special lunch at Al Qantarah Restaurant. The look of anticipatory delight in their eyes indicated we were in for a serious treat, and the dish did not disappoint. Rami seemed to take great pleasure in pouring the fermented yogurt over the platter (we even drank some from wine glasses afterwards! 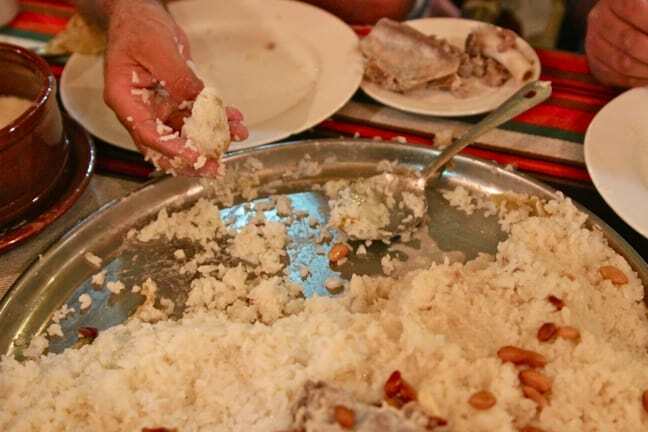 ), and showed us the method of eating it by rolling pieces of lamb and rice into a gooey ball, then gobbling it down. Jameed- Soak the jameed in cold water to cover for 24 to 48 hours. • Drain and melt the jameed in a pot with 1 quart of water over medium heat. • Add the remaining 2 quarts soaking water as it evaporates, until the mixture has the consistency of yogurt (this could take up to 2 hours, and you should ultimately have about 2 quarts liquid jameed). • Strain through a sieve and set it aside. • Save 3/4 for the meat and the rest for the rice, which you will cook separately. Lamb- In a large earthenware casserole, heat 5 tablespoons of clarified butter over medium heat, then cook the lamb until browned on all sides (about 20 minutes). • Remove meat with a slotted spoon and set aside. • Pour off all excess fat and liquid. • Return meat to the casserole with 3/4 of jameed, reduce heat to low, add 2 cups water, sprinkle on the bahārāt (spices) and cook, uncovered, until meat is falling off the bone (about 3 hours). • Do not use any salt, because the jameed is salty, but if you’re using stabilized yogurt you’ll need to salt the meat to taste. • Stir the meat so it is mixed well with the spices and yogurt. Rice- In a heavy, flame-proof casserole or pot with a heavy lid, melt 3 tablespoons of clarified butter over medium-high heat, then cook the rice for 2 minutes, stirring regularly. • Pour in 3 cups of boiling water and the salt, bring to a boil, reduce heat to low, cover, and cook until the rice is tender and all liquid is absorbed (about 20 minutes). • Do not lift the lid to look at the rice, and do not stir the rice as it cooks. • After 20 minutes, if rice is not done, keep adding boiling water in small amounts until the rice has absorbed the additional water and is tender. • When the rice is done, stir in the remaining quarter of the jameed, to make the rice a little watery. Garnish- Melt 1 tablespoon clarified butter in a small skillet and cook until butter is golden (2 to 3 minutes). • Remove and set the butter aside. • Melt the remaining tablespoon of clarified butter in the small skillet and cook the almonds until light golden (about 5 minutes), tossing the nuts. • Add pine nuts and cook until they’re golden (about 3 minutes). • Set the nuts aside.